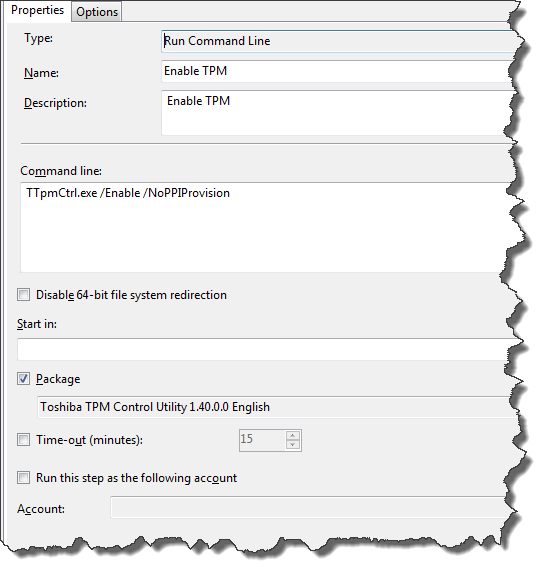 TPM can be activated on Toshiba notebooks using the 'Toshiba TPM Control Utility'. This utility allows the activation of TPM and can suppress the prompt to authorise this activation at the next reboot. At time of writing, the utility is not available on the Toshiba web site, but talk to you sales team and your sales engineer should be able to source it for you. This tool, when packaged in Configuration Manager and called using a ConfigMgr program causes the Task Sequence to fail, I'm not sure why. However, using a 'Run Command Line' task sequence action instead gets around this problem. Package the utility in a software package but instead of creating a program just use the following command from a Run Command Line task sequence action and reference the package with the utility in it. Hi - Sorry for the delay, I've been so busy on new work my I haven't checked by blog since late December :-(. I sourced the utility from my technical support contact at Toshiba. Talk to your sales team and they should be able to help if you have a direct relationship with Toshiba. If you don't, talk to your reseller and see what they can do. The utility is not on the Toshiba web site, I think that is a shame. I used this utility on a number of Toshiba laptops/notebooks that were current models in early 2012. It has been a year since I did this work so I don't remember the exact models. The Protege Z830 was one of the models.